GenreOnline.net: FIRST LOOK AT THE ALL-NEW POWERPUFF GIRLS! 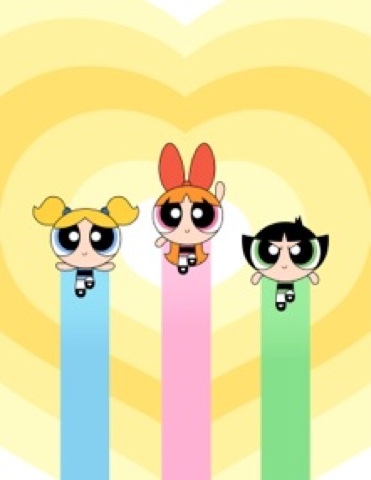 Cartoon Network today unveiled a first look at character artwork featuring the original arbiters of girl power; Blossom, Bubbles and Buttercup from the all-new series, The Powerpuff Girls. The reimagined series, about three girls juggling school and saving the world before bedtime, is slated for a 2016 global launch and will include a brand-new television series, produced by Cartoon Network Studios, and a full licensing program that will roll out across all domestic and international regions. The announcement was made today by Cartoon Network as part of the 2015 Licensing Expo in Las Vegas. Featured at a Cartoon Network Enterprises event to kick off the annual industry trade show were the multi-talented voice actors portraying the lead characters from the upcoming animated series including: Amanda Leighton as Blossom, Kristen Li as Bubbles, Natalie Palamides as Buttercup and Tom Kenny, who will be reprising his role as the Narrator/Mayor. The new series will be executive produced by Nick Jennings, who won an Emmy® Award for his work on Cartoon Network’s Adventure Time, and Bob Boyle creator of Wow! Wow! Wubbzy! will co-executive produce. Rounding out the creative team is a diverse group of talented artists and writers, many of whom grew up watching the original series and come with a special affinity for the characters and overall project. "It has been wonderful to see this new show team bring such passion and positive creative spirit to this iconic property," said Chief Content Officer, Rob Sorcher. "We know that fans of every age will appreciate this new take on saving the world before bedtime." To support the worldwide launch in 2016, Cartoon Network is assembling an all-star roster of licensing partners to create a full consumer products program for the franchise. Spin Master, Ltd. will anchor the program, creating a line of toys including plush, figures and playsets, dolls and more available worldwide in fall 2016. Additionally, in North America, Penguin Young Readers Group will debut a series of books based on The Powerpuff Girls in fall 2016 as part of the Cartoon Network Books imprint, and Disguise Inc. will launch costumes for kids, juniors and adults, as well as year-round dress-up toys and accessories for kids, also available in fall 2016. Warner Home Video will distribute the series’ home entertainment releases. The Powerpuff Girls is one of Cartoon Network’s most enduring original series. Created by Craig McCracken, the series premiered in 1996 and earned two Emmy® Awards along with five nominations and countless animation honors throughout its 78-episode run. The series also spawned a feature film with Warner Bros. Pictures in 2002. With more than $2.5 billion in retail sales generated since its debut, The Powerpuff Girls is one of the top-grossing Cartoon Network brands of all time and it has endured as a global fashion brand with a range of apparel partners and fashion collections around the world.